Welcome Home Series<sup></sup> handlesets are the perfect addition to your front door to create a unique and fashionable entryway to your home. Each is stylishly designed to provide maximum-security protection. There are many styles, finishes and configurations from which to choose. Round Pocket Door Lock The Satin Chrome finish gives the product a modern and minimalist look. This discreet privacy handle is an innovative solution adding locking capability to a pocket door. Installs into a standard 2-1/8" door knob hole and a standard size latch on the door frame. For pocket doors 1.3/8" thick, left or right sliding. This cylinder lock is constructed from solid brass. It features a 5 pin tumbler lock and a keyway that is compatible with Weiser<sup></sup>, Kwikset<sup></sup>, & Weslock<sup></sup>. This item is used to key lock most surface mount handle sets. This pocket door pull is constructed from solid brass. It features a length of 3-3/4 inch with a wide easy grip design. This pull has a mortise installation and comes complete with hardware. This pull is constructed from solid brass and comes finished in chrome. It features a reversible design for left or right handed installations. It has a locking feature and fits on a 1-3/8 inch to 1-3/4 inch thick doors. 1030 Round Satin Chrome Pocket Door Passage Lock Welcome Home Series<sup></sup> handlesets are the perfect addition to your front door to create a unique and fashionable entryway to your home. Each is stylishly designed to provide maximum-security protection. There are many styles, finishes and configurations from which to choose. 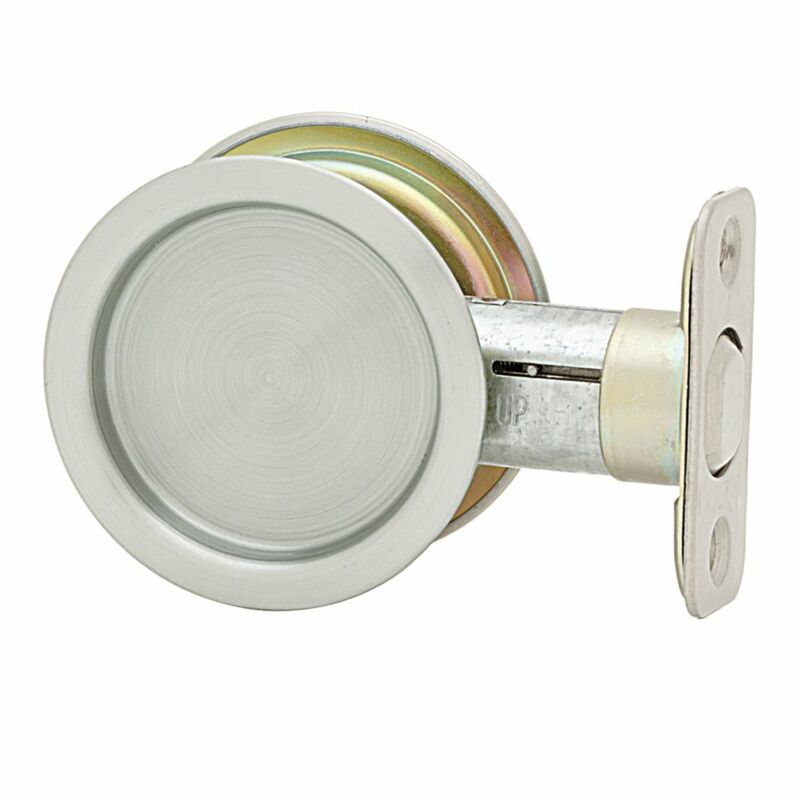 Round Pocket Door Lock The Satin Chrome finish gives the product a modern and minimalist look.